Tomatoes are heavy feeders. They are greedy and like lots of food. Use tomato fertilizer wisely and your plants will reward you. Tomatoes in pots and containers require frequent watering or they will dry out. But watering leaches nutrients out of container plants. So you need to be especially vigilant to include tomato fertilizer in your container gardening plan to get best results. Add a slow-release fertilizer (like Osmocote) to your containers when planting. Nutrients will disperse over time. Try grass clippings. They do double duty as mulch. Apply a couple of inches to the soil surface of your containers. 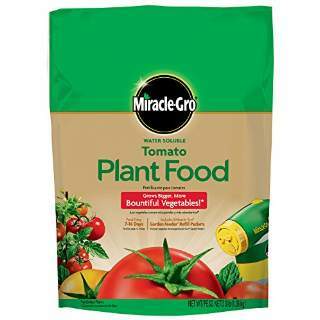 One easy way to fertilize tomatoes is to mix a small amount of soluble, balanced tomato fertilizer (like Miracle-Gro Tomatoes) into water. Fertilize and water at the same time. When it comes to fertilizing tomatoes in pots, little and often is better than a lot, less often. Tomatoes like regular feedings of small amounts of fertilizer rather than infrequent, large doses. Some gardeners swear by weekly feedings or even more often. Others say every two weeks is enough. Take time to find out the best schedule that works for your plants. There are plenty of variables including tomato variety, container size, plant size, your weather, and potting mix type. You’ll know you’re feeding plants too much when they produce more leaves than fruit. If production is low or foliage starts to yellow, you’re probably not feeding enough. A good fertilizer to use on container tomatoes should have more phosphorus (the middle number in a fertilizer’s 3-number series) than nitrogen (the first number in a fertilizer’s 3-number series). Too much nitrogen can mean lots of leaves and few fruit. If you're looking for an excellent selection of pots and containers, try My Pots and Planters or even Amazon.